My old chum Gavin Atkin at intheboatshed has posted about last night's amusing televisual presentation Rivers, starring that thin comic that used to be in a comedy show last century with the fat guy. Gav was hugely amused by this bloke going shopping for stores in Roy's of Wroxham, the self-styled 'world's largest village store' (a slogan that the locals deprecate because it is actually in Hoveton, on the other bank of the river). The bloke recalled that his father was a 'one-pan man' who stocked the galley on his yacht entirely with tins, mainly spam, beans with sausages and cling peaches. He even bought all-day breakfast in a tin. Gav writes: "It...had a distinctly post-War feel about it, and seemed to me to be an amusing but fair account of how I remember men of Rhys Jones senior’s’ generation dealing with the problem of eating out of doors." But don't get the impression that time has stood still since 1946. 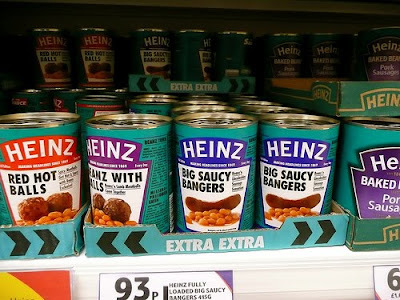 All these are ring-pull cans, so it is even easier to empty the contents into a canteen, heat and eat without the need for a tin opener, oven, multiple hobs, crockery or, unless you are extremely fussy, washing up. I had forgotten how delicious tinned clings are, though. But here the telly got it wrong, so wrong. The bloke recommended evaporated milk, an etoliated confection suitable only for delicate infants or aged aunts. The correct way to serve clings is to take a tube of condensed milk, squeeze a generous glop on top of the peaches, and eat directly out of the can. Better than anything served in the so-called Fat Duck. I'm very amused. My dad was the same when I was a kid but I thought it had largely died out. Perhaps I'm a rare individual who has drifted from the true path of tinned food cookery be cause my kids won't touch it. Tinned steak, they say, tastes of cat food. But you raise an interesting point. Thinking about the issue, I must be a rare case indeed - the food shops still have shelves groaning with tins, so someone must be eating them.